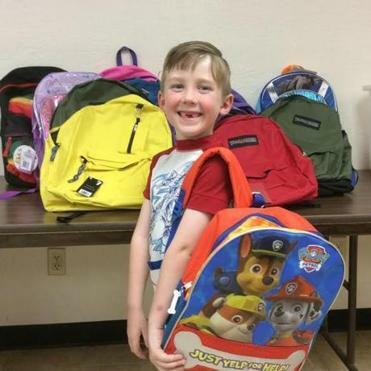 Brayden Collins sported his new backpack from this year’s Interfaith Social Services back-to-school donation drive. Some children winced at the thought of going back to school. Brayden wasn’t one of them. The Weymouth youngster was ready to show off his Justice League backpack and all that filled it last fall. “It came with a brand new box of crayons. . . . He got really cool eraser tops,” said Meaghan Collins, Brayden’s mother. It was her first time participating as a recipient in the annual Interfaith Social Services backpack drive. And while what the 25-year-old mother received might not seem like a lot to some, it changed everything for her, she said. When Collins and her son shopped for his back-to-school backpack last fall, Brayden saw the one he wanted. It was $27. “It’s just like, either buy the backpack that he wants and not have money for something else, or buy him a regular one,” said Collins. She bought him a regular one for $5. Then they went to the drive, and Brayden walked out with the backpack he wanted. The $5 pack now only makes an appearance at sleepovers. Quincy-based Interfaith Social Services, now organizing the fourth installment of its backpack drive, works with low-income families in area communities. Through the years, its goal has remained the same: provide a backpack to every child who needs one. It came up short the first year. The second and third years, though, the organization received 500 backpacks and no child walked away empty-handed, Doane said. He hopes the same will be true this year. Donations will be accepted until Aug. 31; so far, the drive has collected just under 200 backpacks and enough monetary donations to buy another 150. But Doane isn’t worried. “Miraculously throughout the month, we get the word out there,” said Doane. The drive is collecting two types of backpacks — one for grades K-5 and another for grades 6-12. Each backpack should include a spiral notebook, two pocket folders, No. 2 pencils, and Pink Pearl erasers. The organization also suggests including colored pencils or washable markers, glue sticks, and safety scissors in the K-5 backpacks, and a calculator, index cards, pens, highlighters, and three-ring binders for the older students. “We depend on the community to help their neighbors,” said Doane. Collins is one of those. Working for her grandmother when she can and taking babysitting jobs here and there, the young mother is not employed full time. “We have an extremely low income because of it,” said Collins, who moved from a homeless shelter to housing four years ago. But because of the community’s help, she and her son were able to get what he wanted last fall. Brayden has already picked up another backpack from the program for this coming school year, a pack sporting the creatures from Paw Patrol. Ella Torres can be reached at sara.torres@globe.com.